There was a time where brushing her teeth before bed was a struggle yet now she can practically handle the task on her own. Nightly, we motion through the ritual of combing the day’s knots from her tangled curls and slipping her ever-growing limbs into a fresh set of pajamas before she crawls under the sheets of her bed (sometimes ours). We thank God for the blessings He gives us, for the blessing she is to us and we say goodnight. Her mother and I take the steps one toe at a time until the tree occupying a corner of our home invites us with the smell of pine into the living room, we take our favorite spots and we sink into them embracing the silence. We smile. We laugh. We listen to the rhythm of her inhales and exhales through the static of the monitor, the most comforting of Christmas carols. Peace… the noise one seeks in silence. The glow of the Christmas tree provides the only physical source of light in the room while the memories we’ve made under this roof of ours outshine the tiny bulbs in sheer volume. My wife and I catch ourselves staring at the ornaments instead of the television, each one telling a story all its own. Shiny spheres and glass figurines we purchased together. Crystal hearts and icicles plucked from trees of our grandmothers’ past. Traditional ornaments. Whimsical ornaments. Ornaments that hold imprints of a baby girl’s hand and foot from her first Christmas when walking and talking seemed like distant obstacles and not mastered feats. Ornaments that represent a life we’re building together, a tree inhabiting bits and pieces of the lives we combined, a glow illuminating the house we’ve made a home. Love… the brightest source of light in the darkest of corners. Her excitement was contagious and unmatched when we started pulling out the boxes of decorations. She encouraged us to hurry so she could help select branches for the strings of her favorites and she sang along to the songs crackling from our speakers. She exchanged words she forgot for words she made up and she passed on boxes her tiny fingers couldn’t open to focus on the distracting glisten of glitter in bulk. We returned our stockings to their reserved spaces on the mantle and mentally explored the option of adding another in time. We huddled together after it was said and done to soak in the joy that comes with the holiday and before we shoved wrapped gifts around the bottom, we filled the tree with our presence instead. Christmas… the most wonderful time of the year. Here are a few posts from last Christmas, if you're interested. 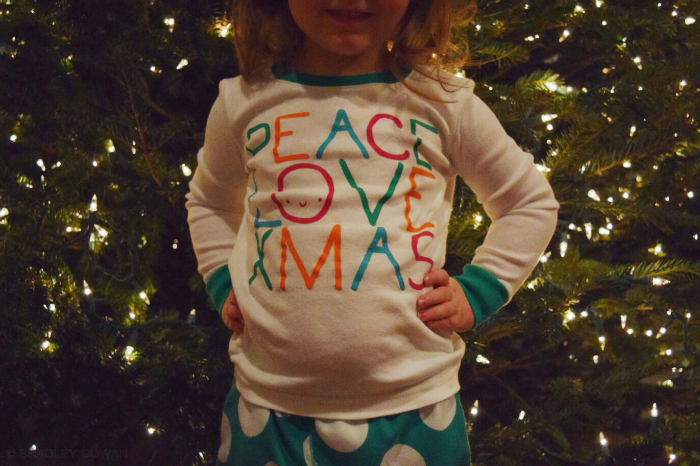 There is nothing like seeing Christmas through the eyes of a child. I couldn't agree more. I've said it before and it's so true... Christmas as a parent is far more fun than it ever was as a child. Their expressions, their joy, their enthusiasm are what the holidays are all about.